It’s taken me more than six months to resurrect my RSS reader (pathetic, I know), but I’ve finally imported my forlorn collection of feeds into the open source application Tiny Tiny RSS. I went with this application based on a recommendation from Joss Winn a while back. It also made sense given UMW has rolled out Domain of One’s Own this year—an initiative that offers the entire campus community their own domain, hosting, and one-click installations from a vast selection of open source applications—amongst which is Tiny Tiny RSS. A little bit of practicing what we preach is always good. More than anything, however, my six month hiatus from reading the web via RSS has reminded me just how invaluable it is to the work I do. A fact that has actually re-inspired my evangelical impulse to push faculty, students, and staff to get on the RSS bus. I mean, how can I resist it’s value when one of the first posts that showed up in my reader was this Rankin Bass animated mashup of John Carpenter’s The Thing (care of Bryan Alexander’s ever inglorious Infocult). It just feels like I am on the web again. A few things about Tiny Tiny RSS. It has a pretty solid collection of plugins with a small, but fairly active, development community. Some of the plugins are packaged with the application, but there are also a fair number that aren’t. The Google Reader Importer plugin is included, you just have to activate it. Given I was moving my archive from Google Reader, this was the first plugin I used. I also had a couple of hundred posts starred in Google Reader that didn’t come over with the import, so I used this hack to the Google Reader importer plugin to preserve the favorited posts as well. 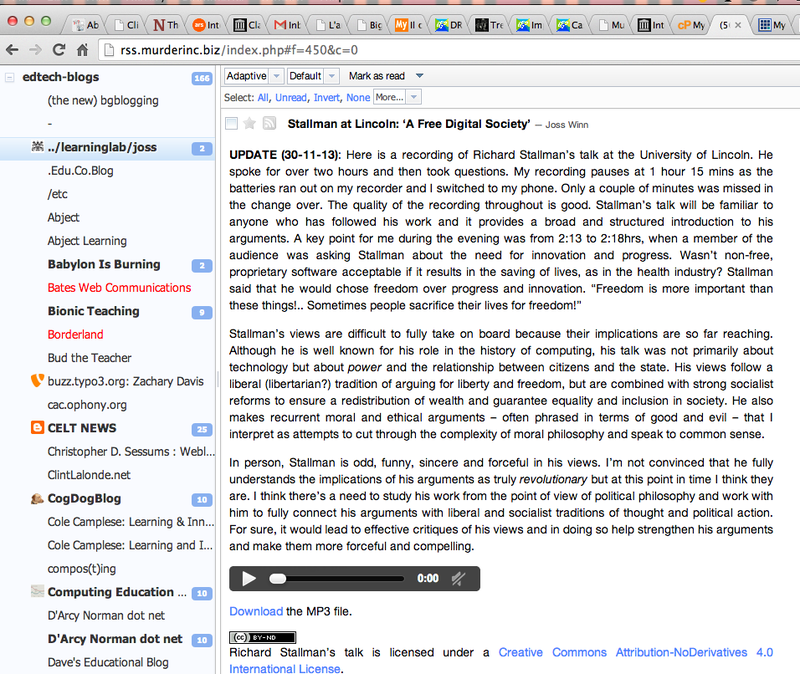 One of the things I noticed right away was that videos don’t embed in Tiny Tiny RSS out-of-the-box. The Videoframes plugin fixes this by enabling embedded videos from a wide range of sites (YouTube, Daily Motion, Vimeo, etc. ), but you have to add it via FTP. This one should be baked in. 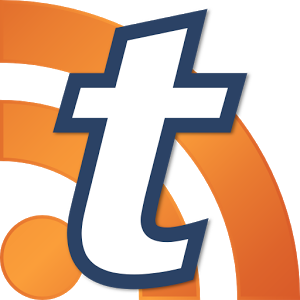 Also, there are a wide range of plugins for sharing posts in your reader out to Twitter, Google+, Tumblr, etc. The plugin for Twitter worked fine, but the plugin for sharing on Tumblr is throwing an error with the latest version, so I might have to jump on the forum. But that’s kinda what I like about Tiny Tiny RSS, it reminds me a bit of the early days of hacking around WordPress. I have to work a bit to customize it for my needs—that said it’s very mature application as is—which helps me understand how it works. I can start trying to trouble shoot some plguins, and even become part of a community around the application to figure it out. I don’t need to be a programmer, I just need to articulate the issue and be patient and willing. What’s more, I can bring what I learn back to the UMW community and beyond. 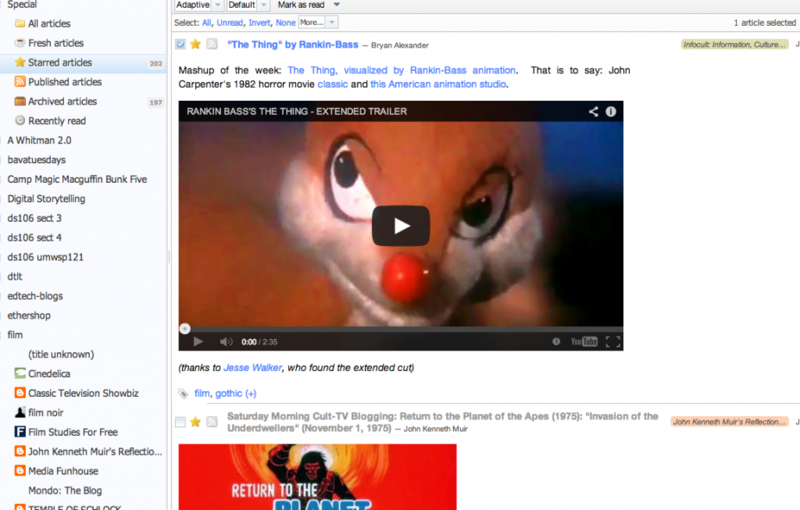 I initially installed Tiny Tiny RSS in the rss.murderinc.biz to give it a test drive. I originally wanted to install it at rss.jimgroom.com, but I didn’t realize I hadn’t set jimgroom.com as an add-on domain at UMW Domains yet. So, when Tim Owens informed me I could add jimgroom.com as an add-on domain to UMW Domains, I wanted to move everything I setup at rss.murderinc.biz to rss.jimgroom.com. Thanks to Installatron, the one-click application installer we have running on both UMW Domains and Reclaim Hosting, it was a cinch. You click on the Clone button for the particular application you installed, and point rss.murderinc.biz to the new subdomain rss.jimgroom.net and alle ist gut! Making sure things are relatively simple as you try and bring an entire campus up to speed on installing and managing their own applciations on their own domain (and subdomains) is absolutely crucial. And what’s available for the UMW community through UMW Domains is also available to anyone who is interested in this experiment outside of UMW at Reclaim Hosting. It’s just another venue through which we can spread the love of what’s possible in one’s own space. Along these lines, I was excited to discover (through Brian Lamb’s most recent post) that there’s a broader sense the web’s not dead yet. And there are a list of excellent reasons why staking your own space on the web that you build, maintain, and future-proof independent of third-party sites (though not necessarily at the exlusion of them) might make good sense. I was never under the delusion that a certain group in edtech was alone in this push, but I admittedly live in my own bubble (if and when I am hooked into my feed reader 🙂 )—so it’s nice to read a broader frame for such an approach. This entry was posted in open source, reclaimopen, rss and tagged open source, reclaimhosting, reclaimopen, rss. Bookmark the permalink. It looks like it, but you can create groups of feeds as folders, right? The organization of feeds is pretty slick. I don’t know how it would be for a RSS Reader pwoer user, but I am simple 🙂 Wuld be interested in your take. Update: Also, you’re also the only person who still blogs! For the record I still blog, read your comments, AND I still read RSS feeds like a meth head (erratically and in huge swathes while fleeing the authorities). I’ll have to try this reader out. I have Fever installed but on my host it was too slow. I’ve been making do with Feedly. (I need footnotes in comments.) I miss Google Reader’s numbers of posts read function as I’d like to mix in some elements of quantified self tracking automatically. Viva Italia. Viva la Perro. Viva la RSS.